Enjoy the savory flavor of these Bacon-Wrapped Asparagus Bundles. 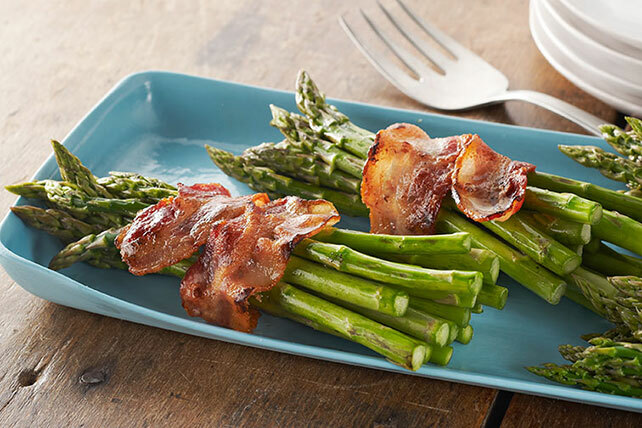 Try this version of bacon-wrapped asparagus as a meaty veggie side dish. Place bacon in single layer on paper towel-covered microwaveable plate. Microwave on HIGH 1 to 1-1/2 min. or until bacon starts to cook but is not crisp. Sprinkle with sugar. Divide asparagus into 4 small bunches. Wrap 1 bacon slice, sugar sides in, in spiral-fashion around each asparagus bundle. Place on rack of foil-covered broiler pan. Lining the broiler pan with foil makes cleanup easier.